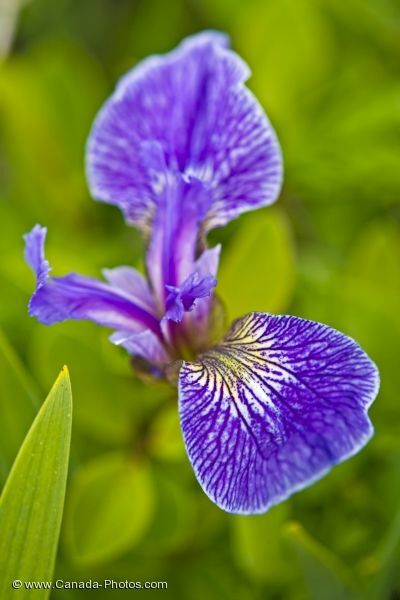 A very colorful and intriguing looking flower when it blossoms, is the Beachhead Iris. At the Burnt Cape Ecological Reserve on Burnt Island in Newfoundland Labrador, the Beachhead Iris is one of over three hundred species of plants/flowers which flourish in the ideal conditions of the botanical region. Three very colorful and detailed petals flower atop this plant around the month of June, growing to a height of about two feet. The stem is surrounded by long, slender leaves which come to a point at the ends. Picture of the colorful hues on the Beachhead Iris at the Burnt Cape Ecological Reserve.